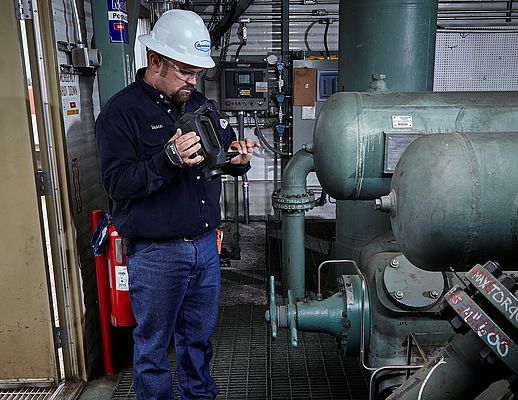 FLIR Systems GFx320 Optical Gas Imaging (OGI) camera offers quick, non-contact measurement of gas leaks in real time. Using its unique High Sensitivity Mode the camera is able to set a new superior standard for gas leak detection performance. High Sensitivity Mode is based upon an image subtraction video processing technique that effectively enhances the thermal sensitivity of the camera. The HSM feature subtracts a percentage of individual pixel signals from frames in the video stream from the subsequent frames, thus enhancing the differences between frames, which make leaks stand out more clearly in the resulting images. Using the high sensitivity mode even the smallest of gas leaks can be spotted using a GFx 320 OGI camera.